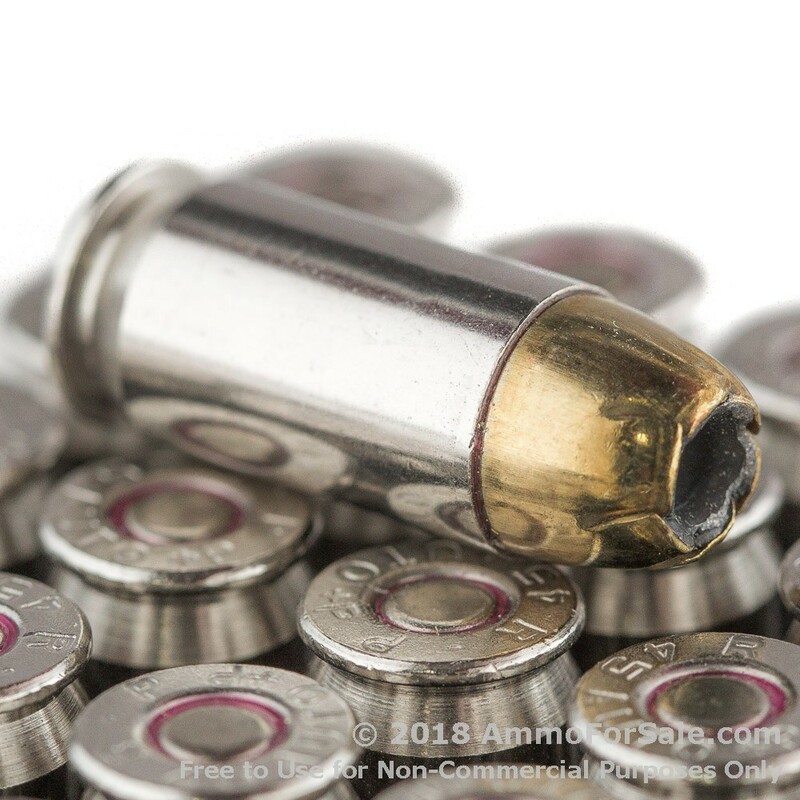 You might think it isn’t possible to make the impressive power of your .45 ACP any more compelling – but it is. In the world of self-defense, it’s not just important to use seriously strong ammunition, it’s vital. That’s why ammunition such as these overpressure rounds are made: to make you better able to defend yourself and your loved ones from an unpredictable attack. These Remington Golden Saber rounds already have match-type accuracy and fantastic ballistic performance, but they’re also +P, giving them increased energy and with it, greater knockdown power. Remington proves their reputation is deserved with these defense rounds. They’re medium-weight at 185 grain, so they both hit hard and fly fast; they have a muzzle velocity of 1,140 feet per second and muzzle energy of 534 foot-pounds. 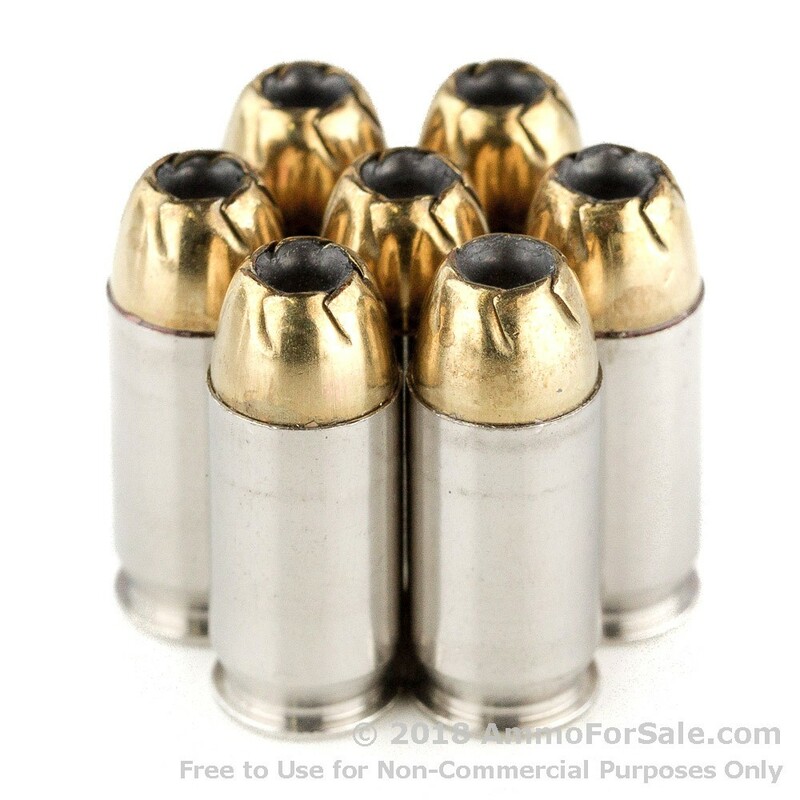 As Jacketed Hollow Points (JHP) they have significantly more controlled expansion, and that means deeper penetration. When it comes to self-defense you want as catastrophic a wound track as possible, and these Golden Sabers deliver. And, of course, they’re +P, so they’re more forceful than regular .45 ACP’s, in fact, they have over 100 foot-pounds more muzzle energy than the non-overpressure Golden Sabers of the same weight. 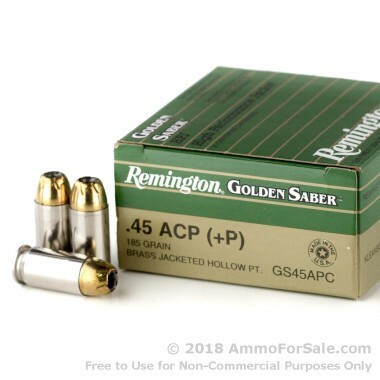 When you feed your .45 ACP, you want to use ammunition from an American company with a rich history and sky-high reputation, and that’s Remington. They’ve been in business since 1816, and since day one they’ve been striving to not just meet but surpass the expectations of shooters everywhere. This ammunition is manufactured to strict specifications at their Lonoke, Arkansas, plant. You get 500 defense rounds in the box, so you can not only keep your gun loaded for defense purposes but train with them as well. Any defense round is stronger than the typical target round, but these +P rounds are immense in their strength. You have no reason to wait and every reason to order without delay – and because these are fresh brass cases with boxer primer, they can be reloaded.